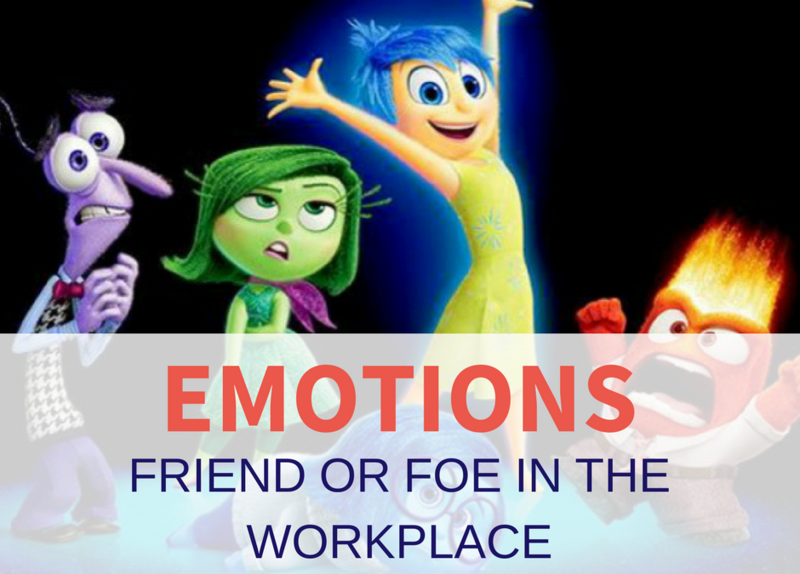 Emotions at work, friend or foe? Traditionally we’ve been taught to keep the 2 separates. Emotions at work conjure up images of screaming banshees or fist fights. We’re told to “take the emotion out of it” when dealing with work situations however I believe something has been lost in translation (and trust me I know about that). If we look at the origins of the word, it comes from the latin ex-movere: that which moves the mind toward the outside. This idea that it literally makes us move shows that it has its place at work: it makes us MOVE, CREATE, ACHIEVE. What’s important though is to realise that, like colours, for each “emotion” there is a wide spectrum, let’s take anger for example, it goes from mild annoyance to full-blown red-in-the-face rage. So why can’t we shut out our emotions when we walk into our office in the morning? Humans are a messy bundle of emotions, pretty much everything we do generates an emotion. Some emotions are barely noticeable and that’s perfectly normal. We spend a majority of our days at work, rubbing our messy bundle of emotions with everyone else’s! So it is totally unrealistic to say that emotions can be removed from the workplace. To do so would mean supressing our emotions which has been recognised as physically and mentally unhealthy. Anyone who’s been left with a thumping headache after a frustrating meeting can confirm. And emotions are a great source of information, primarily about ourselves but also about our environment. Emotions don’t tell us what we are thinking, they are here to inform us on how we are feeling. What we are feeling is as important as what we are thinking and, whether we like it or not, it will impact our decision-making and how we deal with others. How can I manage my emotions at work then? Use them for what they are: a source of information on which to make your decision and decide your behaviour. Gay Hendricks suggests to “let it run through you” meaning you should acknowledge the state you are in. I’ll use the anger example again, I am mighty annoyed about my boss’ comment on the report I wrote. I spent hours on this project, got positive feedback from colleagues and here he goes dismissing it as not being what he asked for. Say it, say it out loud if possible and describe how you feel: “I am mighty p***** off because of what he said”. Don’t dismiss the physical aspects of your emotions, how is the anger being felt in your body: my forehead feels like it’s going to explode, my palms are sweaty and I have a knot in my stomach. And then be brave enough to face what’s behind your emotion because that is where the nuggets of wisdom lay. “Why am I mighty p***** off?” The easy answer here is to dismiss it as “because he was unfair”. Fear and shame, here’s some interesting information, go digging in there for a bit, your self-esteem will thank you for it. This exercise gives you invaluable information about yourself which will help you chose the best course of action. In my example, once I’ve dug deeper I realised that my fear of being judged lead me to only get feedback from colleagues I knew would agree with me rather than give the constructive feedback I needed and actually several aspects of my report are less than adequate. Great learnings that enable me to move forward. Another way to use this information: how I choose to handle myself. By now the “effect” of the emotions will have receded and the logic brain can start functioning to the best of its ability. I found out that my fear of consequences lead me to stay silent and keep my head low in front of my boss sending the message that I may not be as mature as he needs me to be. Now I’ve let my emotion “inform” me I am empowered and I can exchange with my manager on an equal footing as the responsible, constructive colleague I am. Emotions at works are your friends, they are a useful ally and not a foe to lock up 8 hours a day. Trust me your colleagues and your family and friends will thank you for it. What are your examples of dealing with emotions in your professional life, struggles or wins? As always if you have questions or comments don’t hesitate I’d love to hear them.